20120720 - Up and to the desk. L and the boys out somewhere. At the end of the day D and I ran to the bank and I got a haircut. 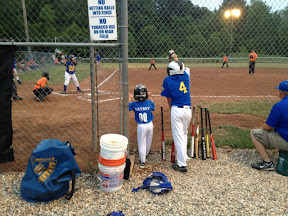 Home for dinner and then we headed to the ballfields. We played a team of HUGE boys that pitched like gunfire. Almost everyone struck out. D got a hit the 1 time he was up, but thrown out at 1st. L got a hit, well she got hit, right in the kidney from a foul ball :-o G was the bat boy in his new shirt. We were run ruled during the 5th, 1-11. LD&J went home with Gma&paB to our house, while J&I help Mr. Varney pump up his flat tire and followed them home and helped fix it. All back home late. All boys to bed.